Recently youth educational centre Fialta held subbotnik in one of the Minsk districts. Volunteers were equipping the abandoned site together with municipal services. Minsk inhabitants protest against construction through dedicated web site. Inhabitants have created a special web site where they give detailed explanation of their concerns. Superheroes School/ Creative City is recruiting citizens to its Summer school on implementing urban projects. Superheroes School/ Creative City is recruiting citizens to its Summer school. Superheroes School is designed for those who want to learn how to implement urban projects and make Minsk most interesting and creative city. The School is designed for 2 months with tuition fee of 2 million rubles ($130). During the first Superheroes School, six projects were implemented in partnership with the business and public utilities, including the reconstruction of the stairs, Book Festival, street library, etc. Belarusian National Platform's conference to be held on 25 June. The conference of the EaP CSF National Platform is titled as Civil Society in Belarus: Challenges of Stagnation and Governmentalizing of the Third Sector. The key task of the event is to decide whether the Platform should exist as a whole, taking into consideration the crisis of the system of international security and the European Neighbourhood Policy, as well as civic-political apathy in the country. Youth educational centre Fialta held subbotnik in one of the Minsk districts on 13 June. 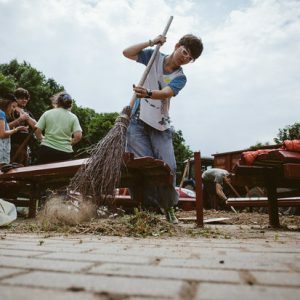 Volunteers were equipping the abandoned site together with municipal services. At the same time locals did not attend the event. The activists explain this phenomenon with a legacy of the forced Soviet subbotnik and continue to raise awareness among citizens about the benefits of joint efforts for the common good. Call for experts to analyse the capacity building sector of Belarusian civil society organisations. Office for European Expertise and Communications (OEEC) recruits researchers to study a capacity building sector for Belarusian civil society organisations. The study continues a series of the sectoral analyses facilitated by OEEC in different fields, like civic education,gender, regional development, etc. and aims to provide evidence-based data for the efficient CSO’s activity. The report will be published and available for public feedback. The fifth registration Congress of the Belarusian Christian Democracy Party took place on 13 June in Minsk. The Congress was attended by about 300 delegates and guests. Christian Democrats took necessary decisions for the new attempt to obtain legal registration for the party and for the national public association with the name Belarusian Christian Democracy. It is the fifth attempt of the party to get a legal status in the country. Small Deeds contest 2015. The Assembly of pro-democratic NGOs invites NGOs and civic initiatives to participate in the competition to strengthen civil society in Belarus. Priority is given to activities aimed at the protection of human rights and civil society development; identifying active and motivated people for their involvement in civic life, as well as members of the Assembly. Application deadline is 12 July. Book about 187 Belarusian political prisoners presented in Minsk. The book is based on materials from the web site palitviazni.info. The book Chronicles of Belarusian Political Prisoners describes the fate of 187 Belarusian political prisoners who suffered for their political views. Ministry of Information restricted access to the site KYKY.org. This is the first case of official and open blocking of the media in Belarus with the relevant publication on the Ministry’s website. On 15 June censorship considered that some KYKY publications harm the national interests of Belarus. Now the web site is available at a new domain KYKY.io. Meanwhile Generation.by made a quick analysis of how the Internet community met the incident and came to the conclusion that the reaction of Belarusians, unfortunately, has been rather summer-relaxed. Annual conference of International Labour Organisation debates “Belarusian question”. Committee on norms and standards of ILO hold in Geneva on the fifth of June has another round of discussion on violations of rights of workers and trade unions in Belarus. Belarus is still a part of 25 countries short-list who perform systematic violations of labour rights. Trade unions leader Aliaksandr Jarašuk has underlined that “situation is still critical and independent trade unions are in reservation and new decree number 4 does not change it to better”. Free bike-rent system “Dobry rovar” (Kind Bike) will operate in Minsk from 10 June till 1 October. The system will be available at 12 bike-points. This year organisers will place about 4 scores of bicycles with special code-lockers. For getting a code one needs to pass through free registration at project’s web site, choose a free bike using an interactive map and rent it for a day. A reminding SMS will be sent at the end of renting period. Minsk inhabitants protest against construction through dedicated website. Residents of private buildings in centre of Minsk are waiting for demolition of their houses for more than 15 years. Streets of Čarviakova and Uradzhajnaja are in really difficult situation – demolition deadlines are delayed all the time and people neither get new apartments neither start repairing theirs. Inhabitants have created a special web site where they give detailed explanation of their problems and where they place all their steps in struggle with constructors. “Art islands” will appear at Kamsamolskaje lake in summer 2015. Unique in its sizes and concept art-project will be realised in Belarus this summer. 10 volume space objects by Belarusian artists will form an exposition at the one of islands of Kamsamolskaje lake water area. “Art islands” project is run by National centre of contemporary arts in collaboration with Ministry of culture, Minsk city council and financial support of Alfa-Bank. Is Russia About to Send New Weapons to Belarus? In this difficult time, Minsk struggles to find a middle ground in confrontation between Russia, Ukraine and the West. Minsk pursues a policy of balancing for some years already. It looks to avoid choosing only between Russia and the West. 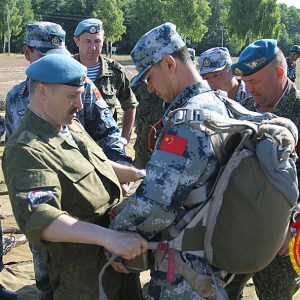 Facing Putin's refusal to help modernise Belarusian army, three years ago Belarus launched unprecedented military cooperation projects with China. The statement by Raukou means that one more time, Belarusian officials commented on possible Russia's base as something still to be negotiated. They essentially dismiss the statement of the Chief Commander of Russia's Air Force Viktor Bondarev who announced last October establishment of a Russia's airbase in Eastern Belarusian city of Babruysk in 2016. Minsk has a lot of reasons to keep distance from the issue. It primarily wishes to stay as much as possible neutral in current confrontation between Russia and NATO. This confrontation makes both sides deploy ever more military units and equipment in the region around Belarus. For instance, the US and Lithuanian governments agreed on 17 June to station US forces and weapons in Lithuania. Minsk could have reconciled with this major change in regional security situation, as it has more vital concerns to worry about. Moscow, however, considers the US arrival to the region as crossing a red line by deploying military equipment – although without personnel – in the former Soviet Union. So far Russia limited to rhetoric its response to this US decision as far as Belarus is concerned. Moscow is expected to deliver four batteries of S-300 surface-to-air missile (SAM) systems to Belarus by the end of this year. While undoubtedly important, this delivery of the systems decommissioned from the Russian army solely helps Minsk replace its older SAM systems and was scheduled years ago. Last week, Russian Nezavisimaya Gazeta daily wrote about possible supply of Iskander short-range ballistic missile systems to Belarusian army. This offensive system should replace its Soviet-time predecessors and strengthen Belarusian army's capabilities. As early as in 2007, Minsk announced its plans to get Iskanders “within the framework of the Belarusian state military equipment program implementation through 2015”. By that he meant Palanez multiple rocket launcher – a new Belarusian defence product which underwent recently trials in China. In May, the military parade in Minsk featured this first major weapons system produced in independent Belarus. Military analyst Alyaksandr Alesin immediately wrote about possible Chinese involvement into designing of Palanez. On 23 June, the Jane's Defence Weekly confirmed this guess. It reported quoting a Chinese source that in 2012 China and Belarus signed an agreement to develop a new SAM system. In 2013, the two countries decided to create the new multiple rocket launcher system. It is a very illustrative move. Kremlin demonstrates ever less willingness to pay the military bill of its Belarusian ally. Moscow refused to give Minsk newer aircraft preferring to give them to African countries with disastrous credit history. Apparently, in recent years Minsk got air defence equipment only after it accepted Russian air base deployment in Belarus. Facing the same problem with getting surface-to-surface rocket systems from Russia, Lukashenka simply looked for help somewhere else – in China. No wonder, the government in Minsk for many years courts China hoping to avoid in its foreign policy choice between Russia and the West by opting for cooperation with Chinese global might. Minsk also organised a minor military exercise in Southern Belarus bordering on Ukraine. The exercise launched last week could have easily provoked Kyiv. After all, it involved border guards, territorial defence and special operations forces. Belarusian officials openly express their concern over the instability in Ukraine and some days ago Chairman of Belarus' Customs Committee Yury Sian'ko complained about illegal weapons coming from Ukraine. Furthermore, Belarus recently established one more unit of guards on the border with Ukraine and rapidly constructed sophisticated border installations where never in history was one. The latest exercises were just one more step in this direction. However, to assure Kyiv even in these circumstances Minsk invited to participate in these drills not Russian but Chinese special forces. Belarus balancing between its largest neighbours is far less chaotic than it seems at the first glance. Minsk not only avoided to support Russia on Crimea but as recently as in April Lukashenka again acknowledged Abkhazia a part of Georgia. Minsk consistently strives to work with new government in Kyiv and has supplied Ukraine with many vital materials in its war effort. Concurrently, Minsk managed to put on hold the issue of Russian air base and cooperated with China in sensitive military area. Given the Russia's leverage over Belarus economy and society on the one hand, and strenuous relations between Belarus and the West, Belarusian government has little space to manoeuvre. It cannot ignore Belarus' location next door to the centre of Russia and Belarus' tightly interconnectedness with post-Soviet space. The consequences of failure to balance between Russia and the West will be disastrous – destabilisation and even loss of national independence. Isolation of the country in the West, Ukraine's or Western attempts to make Belarus take a more clear position on Russia's policy in the region will render Belarus extremely vulnerable before Putin's pressure. Despite all efforts of Minsk, China cannot really substitute the Western countries as an alternative to Russia anytime soon.